Falcon couldn't see. Now it flies with better eyes. With a huff, and a puff, and a turn of her head to the side, Banner the lanner falcon made it through her surgery. She was just fine. Would everyone please stop staring at her now? Banner belongs to Jim and Nancy Cowan at the New Hampshire School of Falconry. She is the first falcon in the world to have cataract surgery. Shes had a cataract in each of her eyes. A cataract is a eye problem that makes vision blurry. Without her sight, she hasnt been able to hunt. Or even fly. Monday, a veterinary team carefully drugged her. Then they cut into her cornea. That's a part of the eye. The cloudy protein from the cataract was removed. An artificial lens was implanted. Finally, the cornea was shut again. It amazes me how strong she is, Nancy Cowan said. She watched Banners clear dark eyes scan the hallway. Lanners have a reputation as quiet birds, and I think it works for her. Shes a bit sweeter than other falcons. Banners surgery was originally set for February. It was postponed several times. The team had to create a perfect new artificial lens. They had to battle health problems of their own. George Messenger of Fisherville Animal Hospital, who supervised the anesthesia, underwent heart surgery. Ruth Marrion, a veterinary eye doctor, performed the surgery while seated. She broke her leg last month. Seven people hovered over Banner in the operating room. Dozens more around the world had helped design the artificial lenses. I-Med, a Canadian manufacturer, donated the lenses. They are about 6 millimeters wide. Capital Area Veterinary Emergency Services in Concord donated the operating room and supplies. Messenger and Marrion both donated their time. A eye lens has two parts. One is a thin covering. It's called the capsule, which is like a baggie. Then there's the contents. It's normally clear like a raw egg white. The dense contents help the eye focus light. That helps draw crisp images to the optic nerve. A lens with a cataract is like a baggie filled with cooked egg white. It lets only limited light through to the nerve. Dr. Marrion cut a tiny hole through the baggie. She vacuumed out the bad contents. She folded the artificial lens, slipped it through the small hole and placed it in the baggie. It should hold it in place. The surgery went smoothly. But Messenger wasnt ready to celebrate. Not until after the very last step. That was to remove the breathing tube in Banners throat. The tube allowed them to pump anesthesia to her. The process is crucially important, he said. Then, veterinary technician Shaela Messenger carried the bird into the hallway. The Cowans and all of the vet staff smiled. But a few minutes later, Shaela whispered to George Messenger. The bird wasnt waking up. So the two walked silently to the incubator. In the dark heated cage, Banner could stay warm without being held. And she might be more likely to wake up, they said. Banner then opened her feathered eyelids halfway. She waggled her head. Then, she stood, wobbling a little. She puffed out her chest and stretched her wings. They filled the cage. Banner will receive special eye drops for a few weeks. That's to make sure her eyelids dont become too irritated. The Cowans both cried with relief at the first sign Banner had survived. They had been told by some that eye surgery on the falcon could not be done. As Nancy Cowan held the bird on a special glove, Jim Cowan shook a leather tassel a few feet away. He smiled when Banner turned toward it. You can see something all right, he said. You can see something. Flying for 15 hours nonstop fun or boring? It is amazing that a bird can have eye surgery. 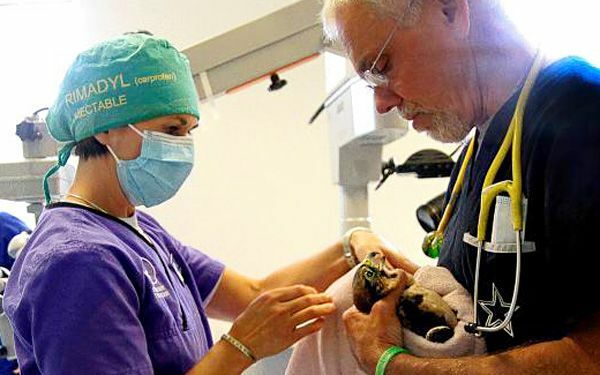 I think this is amazing because a falcon had survived an eye surgery. I do not agree that a falcon can survive a surgery because most Falcons do not make surgeries. I can't believe that a falcon made a surgery. I learned that some Falcons make surgeries because some of the surgeries go well and if they go well they will be pretty much alive. I am amazed because a falcon has made a surgery that he or she was given. I like the the falcon. He looks real cute. That story was awesome! 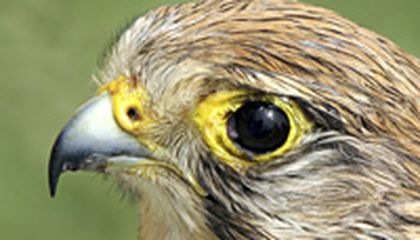 The falcon had bad eyes, and the doctors donated time to fix his eyes, now the bird can see. I red this article and.I didn't now they were messenger bird .Well they can break their wig.and that is it. That's incredible a falcon that couldn't see. i loved how they made it to where it could see again.If a falcon can't see it cant hunt or fly.